It’s pretty obvious that any cannabis strain named after the most recognizable musician in the music genre most often associated with marijuana usage has to be a high quality strain, and Bob Marley Sativa is just that. Even though it’s not the highest yielding strain when grown indoors, the amazing high it gives is a clear proof that quality can be more important than quantity, and if you grow Bob Marley Sativa outdoors, you’ll be getting both. Because it’s a plant that thrives best in the sunlight and in warmer climates, indoor growing can be too challenging for some, so it should be recommended only for experienced growers and personal use. Bob Marley Sativa is a Sativa-dominant hybrid, with a genetic makeup of 70-30 in favor of Sativa, which is a fact anyone can clearly notice at first glance. Bob Marley Sativa can get freakishly tall outdoors – more than 9 feet – with plenty of branches and long, elegant leaves. On the top of the plant there’s usually a large cola where most of the buds are located. 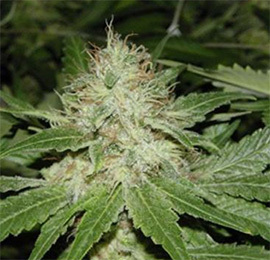 The buds themselves are small, with orange and red hair and glistening with frost, and while their size might not make for an impressive sight, it doesn’t do justice to the potency of this great cannabis strain. The sweet and exotic taste of Bob Marley Sativa is noticeable from the first toke, and it only keeps getting better from there as it starts doing its things and the excellent high starts creeping in. It’s not a fast hitting high by any means, but it will leave anyone feeling happy and uplifted in a relaxed, all-is-good-with-the-world kind of way. Bob Marley Sativa is a good cannabis strain for when you’re feeling down, or when you’re anxious, and it does more than simply take the edge off. There’s a thing about Bob Marley Sativa – it loves sunlight, and it strongly prefers being grown outside, even though it might be hard to hide a plant as tall as this one can get. Bob Marley Sativa’s love of the outdoors translates into some issues when grown indoors – it will need either plenty of headspace or a way to keep it from growing very tall, and the branching might cause a problem with light penetration. That’s why this strain would be best grown by people who know how to deal with very tall and branchy plants, and novices aren’t usually those people. Buying Bob Marley Sativa seeds online should be a piece of cake, as it can be found in a decent number of grow shops, seed banks, or other cannabis companies around the world.